was taking applications to go to Mars in 2023(? ), I was considering getting into shape and applying. I mentioned this to a close friend, my lady, and my mom, and all them responded with varying degrees of puzzlement. Reactions ranging from “Huh?” to “Do you want to leave me behind?”. My thoughts were I could have a chance to be apart of something epic even if something could go wrong. I was born too late to explore the Earth, and too early to explore the Galaxy. Anyways, I’m not going now. Recently I’ve been watching Discovery News’ YouTube channel, and they did a piece on the whole traveling to Mars thing: “Basically you’re going there to die” (Something along those lines). A had a big grin on my face. Not because I was a fool to think it could happen, but because I’m one of the few people on this planet who had “And you wanted to go to Mars…” said to them. 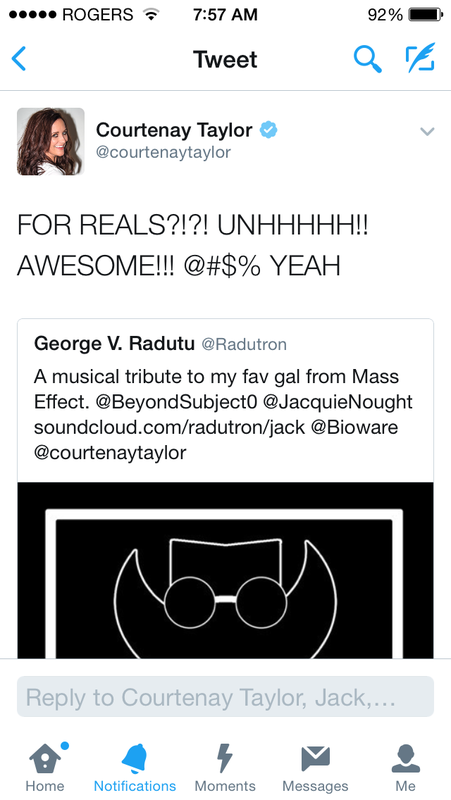 I posted the song “Jack” and tagged her character’s voice actor on Twitter. I did this because I appreciate her work and wanted to show her that. Social media is great for getting in contact with these performers no matter how casual it may be. Anyways, she responded and it’s bloody f’n cool, man! I don’t know if she actually likes the track, but at least she appreciates it. I’ll be doing the same with the other tracks once they’re finished, posting the complete album on bandcamp/soundcloud/YouTube. I don’t expect acknowledgement but it sure is a hoot and a holler when it happens.